Finding some cool fish tank decorations could be tricky if you’ve never owned an aquarium before. It’s important to take into account the size of the fish, the type of tank, and the overall design. Because we want to give you only the best possible advice, we’ve looked at some of the most highly-praised ornaments for fish tanks and other interesting decorations and compiled them into a list that you can check below. One excellent choice of an aquarium decoration is this piece that features a sizeable grey castle that is perched upon a rocky hill. Starting with the cone-shaped roof, archways, and ending with all the stone details, they all provide a realistic feel. Thanks to the holes located in the castle, the fish have hideaways where they can rest as well as other passageways that let them play to reduce the boredom. Moreover, the unit is manufactured from durable resin. Also, the castle is double-sided so you can put it anywhere inside the fish tank. One important aspect is that the decoration is safe to use in both freshwater and saltwater aquariums. You can make your fish happy if you decide to get this lovely piece of tank decoration made from fully non-toxic resin material. Any fish would feel great using this aquarium decoration because they can have their privacy but also have fun at the same time. Furthermore, the unit does an excellent job if you place it in saltwater or freshwater. Keep in mind that this decoration is small-sized so make sure it is compatible with the size of your fish tank. A major plus is the fact that the color of this ornament never fades away because it is made strictly from eco-friendly elements. There’s nothing better than having a fish tank with good decorations inside. These come in handy for creating a natural environment for the fish and also allow fish to live in nitrate-free water. The fluffy moss balls are live plants that absorb all the nitrates found in the water, leaving the fish tank safe for the fish. The best part is that these decorations don’t require special maintenance and can live up to 100 years with just minimal care. All they need is some light and a little bit of freshwater. They can also prevent algae breeding waste and dead matter such as ammonia and phosphate. When planning to invest in a beautiful fish tank that everyone will admire, it’s mandatory that you get decorations that look as real as possible. You can’t go wrong with this sunken shipwreck that is specially designed to make fish go crazy and play for hours. An interesting feature that shouldn’t be overlooked is that this piece of tank decoration can be used in saltwater tanks or freshwater containers. Either way, the fish will be safe and sound because the resin used in the manufacturing process is entirely non-toxic. Plus, this ornament adds plenty of originality to any fish tank. 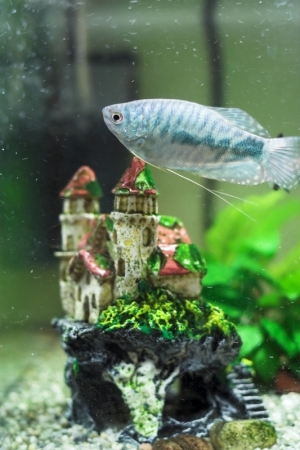 If you’re in the market for some fish tank ornaments that are both good-looking and durable, then you need to take a look at this amazing castle. The unit is built from eco-friendly toxin resin that ensures the vivid color won’t fade away no matter how much time the decorations remains inside the tank. You can place the piece inside any water, be it freshwater or saltwater. Before ordering the product, you need to pay attention to the size of your fish tank so that this decoration is not too big. The ornament is flat and dense enough to prevent it from falling. Pet fish spend their entire time in the tank. So, it’s no wonder they get bored quickly. To prevent boredom, you need lovely fish decorations that are appealing to them. This ornament is incredibly lightweight but, because the base is made of ceramic, it won’t fall when placed in the fish tank. Also, the plant is manufactured from a safe plastic material which won’t cause any harm to your fish. The product can be purchased in two different colors, according to your preferences. Plus, this fish tank decoration is suitable for a variety of fish, such as goldfish or betta. You can add natural beauty to your fish tank with the help of this high-quality bridge made of premium resin and other eco-friendly materials. The product is completely safe for the entire aquatic life, and it doesn’t pollute the water tank. In addition, the decoration is perfect for a fish tank with a water capacity of under 20 gallons. It provides a natural environment feeling because of the vibrant colors and beautiful scenery that resemble a real bridge. Not to mention that this ornament has so many hiding spots where fish can retreat when they don’t want to be bothered. Because fish that live in an aquarium need to feel exactly like in their natural habitat, it’s crucial that you get items that look a lot like the environment they’re used to. This water plant ornament is a great addition to any fish tank because, once you put it in the water container, you can’t even tell it’s made of plastic. The color of the ornament is so vivid that it adds life to the aquarium. Fish will be happy and ready for playtime. The unit consists of two parts, the plant which is made of plastic, and the base, built from durable ceramic. There’s something appealing about fish aquariums that glow in the dark. This amazing piece of decoration is outfitted with a glowing effect that occurs under actinic lighting. Because of this incredibly cool feature, the unit brings a fantastic sea world landscape that looks great in your aquarium. The decoration is suitable for both fresh and saltwater environments, and it won’t cause any danger for fish. Due to the resin base that carries some weight, the element stands perfectly in the fish tank. This glowing decoration is manufactured from non-toxic silicone, and it is entirely odorless and fade-resistant. Selecting the best aquarium decorations is a task that many fish lovers find particularly challenging. This happens because the market is completely filled with countless similar aquarium ornaments. Similarly, there are plenty of alternative DIY cool aquarium decoration ideas that one might find it hard to choose between. To make this whole process easier for you, we have decided to help you by composing a list of important features and aspects that all fish enthusiasts should think about before making any purchases. Even more so, these considerations are focused on what the specialists consider to be the most important aspects when it comes to shopping in this line of products. First things first, before you make any decision, you should consider the pet’s safety. As you already know, fish are often predisposed to numerous diseases that can be easily transmitted. In order to make sure that your pet won’t be affected by either or them you should take a few precautionary measures. For instance, if you purchase awesome fish tank decorations, you should check to see if they are safe to place in a freshwater/saltwater tank. Moreover, you should verify whether or not the rocks that you have purchased have rough surfaces. If so, it is advisable that you do not use them in the tank as they might cause harm to the pet. Likewise, if you decide to buy gravel as a substrate for the tank, you should only settle for medium sized pieces so that it won’t end up trapping the fish underneath it. If you don’t own a fish that necessarily needs substrate (such as an eel, ray or knifefish), you can construct a tank design that does not feature sand or gravel. If you are still researching cool fish tank decoration ideas, we believe that it is fit to remind you that the most important factor that can determine how your tank looks is the theme. Therefore you should go online and search for specific kinds of ornaments. On the one hand, you could pick the classic by now castle, or a shipwreck figurine. Still, if you are not afraid to experiment and create an original design, we suggest that you opt for movies inspired decoration such as a Harry Potter aquarium or a Finding Nemo ornament. Besides, you should make these decisions by also considering the age of the tank’s owner as well as his/her personal preferences. Moreover, if you yourself are a handy person, you should try out some DIY projects. For instance, by following a set of instructions you could transform the tank into the perfect space for a Jedi battle. 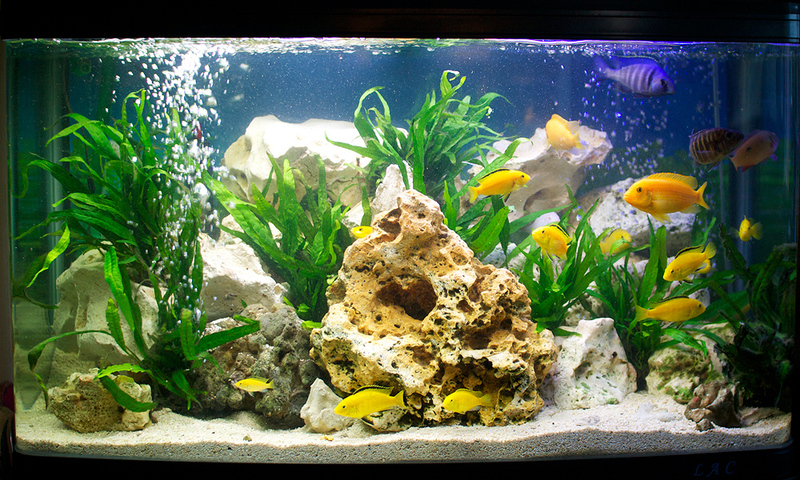 Moreover, for a more realistic looking aquarium, you could secure basically any picture to the back of your tank. This way, you’ll be able to totally transform the unit into anything you desire. Similarly, some other tank owners have decided to spice up their tanks by sticking vinyl stickers to the sides of the aquarium or by adding Holidays inspired figurines into it. Before you jump to the chance of ordering all the decorations that you find appealing, we believe that it is prudent that we remind you of a few extra aspects. Firstly, you should always make sure that the product/ornament that you have ordered is capable of fitting the space that you have available. Although this sounds like a no-brainer, it is crucial that you spend some time measuring the dimensions of the unit that you intend to decorate. Moreover, before you order anything, it might be a good idea to go ahead and read what previous purchasers of the product that you find appealing had to say about it. This is particularly important as such comments might reveal the pros and the cons of the model that you have selected. Similarly, before you decide on what items to buy you should consider the limitations of the tank itself. For instance, a tall aquarium might be better suited to house natural, tall plants while a wider one is better to decorate with more than one type of (not that tall) plants. All in all, it is important that once finished the tank looks aesthetically pleasing. By following this line of thoughts, another thing that you should contemplate is the fact that you should not overcrowd the tank with ornaments. In fact, if you are interested in a modern looking unit, it is best that you opt for a minimalist, well put together aquarium rather than a busy looking one. According to the specialists, if you want to be satisfied with the final result you should start the process of decorating the aquarium by searching for online models and by forming an idea about how you want the unit to look in the end. This way, you can gradually purchase the needed products and safely integrate them into the design. Although your original idea might change during the process of decorating, it is safe to assume that that original view will help you not deviate and create a total mess. Still, if you feel like you need extra help we warmly recommend that you ask a professional for advice and an honest option. The main advantage of doing so is having someone that can help you make safe decisions that will not cause harm to the fish pets. Moreover, if your design lacks order, a specialist can help you recreate it. Furthermore, don’t forget that the internet is filled with interesting articles written by professionals and with videos that can explain to you the importance of balancing your design. So, don’t let your doubts keep you from expressing your creativity. Go ahead and start decorating, your pet fish will certainly enjoy its newly revamped home!